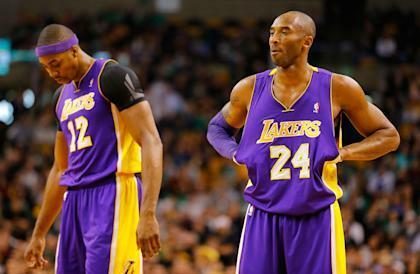 BOSTON – Kobe Bryant and Dwight Howard had always been a reluctant partnership, two stars long suspecting what turned out to be the indisputable truth: They were destined to be terrible teammates. 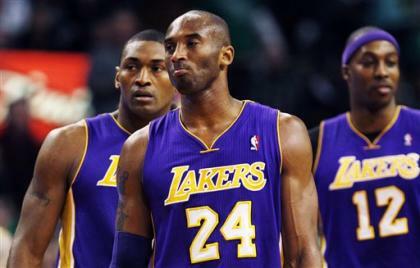 Nevertheless, Bryant reached out to Howard early on Thursday to defuse the drama, he told Yahoo! Sports. He fired off a text message to insist that a part of his interview with the great Boston sportswriter, Jackie MacMullan, had been misconstrued in the public eye. Bryant swore he wasn't calling out Howard about sitting three straight games with a shoulder injury, that he wasn't questioning his toughness. "Listen, I really think people ran in the wrong direction with those quotes," Bryant told Y! Sports. "And I think that put Dwight on the defense, put him a little on edge. But that wasn't the intention, nor the purpose. "I didn't say anything earth-shattering. I didn't say anything I haven't been saying all year. "Honestly, I didn't take a run at him." Truth be told, the Lakers are in deep, deep trouble – 3½ games back of the eighth spot in the Western Conference. They've lost Pau Gasol for several weeks and could be completely out of the playoff chase once he returns to the floor. Howard was out of sync in his return, fouling out in 28 minutes with little, if no, impact on the game. In Howard's defense, the doctors had told him that he could expect to be out with back surgery into December – even January – and yet he had rehabilitated so well that he made opening night. Few players took the physical beating laid upon Howard in Orlando, the hard fouls, the wild swings, the shots delivered on the league's Goliath that were long tolerated. He did play through the back injury a year ago, until surgery was unavoidable. "They can say what they want to say," Howard said softly at his locker. "None of these people are playing. None of these people have had injuries. They can say what they want about playing through pain or playing through injuries. "I spent a whole summer trying to recover because I wanted to play through pain, show people I'm tough." This was Bryant's concern before the trade this summer, and after it. Rest assured, there was a reason the Lakers were third behind the Brooklyn Nets and Dallas Mavericks on Howard's preferred list of trade partners. First of all, there were doubts about the depth of talent to win a championship – and those turned out to be legitimate. What's more, he knew the partnership with Bryant would be troublesome for him. And when Bryant and Steve Nash were enthusiastic about the arrival of Mike D'Antoni as coach, Howard badly wanted to play for Phil Jackson. D'Antoni had no use for Howard with Team USA, nor the New York Knicks when his name was raised in possible trade discussions. D'Antoni made sure to tell everyone Howard had been medically cleared to play in each of the three games he missed recently, and he sounded minimally sympathetic toward Howard's endurance of pain on Thursday night. For the Lakers, Jackson would've been the right coach to thrust Bryant and Howard together. D'Antoni hasn't a chance to do it. For now, the Lakers are too far gone to think there's a bonding process that'll serve to salvage this season. Yes, the Lakers had won six of seven games since the cleansing of that team meeting in Memphis, but everything has changed this week. Gasol's gone, Howard is searching and these Lakers simply aren't constructed to resurrect themselves in the playoff chase. For the future, the Lakers' play hasn't changed, nor will it. They have to give Dwight Howard a chance to recuperate his back, his shoulder, and understand that he can eventually still be a franchise center. And yet, as Bryant told MacMullan, "We don't have time for [Howard's shoulder] to heal. We need some urgency." Bryant has been around a long time to be too surprised his words were construed as a call to arms for Howard. Make no mistake: That interview practically promised Howard would be in the lineup on Thursday night, that he would push through the pain and redirect the narrative on himself. Nevertheless, Howard still seemed bothered with Bryant, and, well, Bryant seemed unbothered with it. He shot Howard his text, let him know he wasn't making a run at him. Whatever. From the start, this partnership promised to be an uneasy proposition, and it's been something of a self-perpetuating prophecy. Kobe and Dwight always knew the deal here. With winning, perhaps they could tolerate each other. With losing, a deep disdain. "We communicate," Bryant told Y! Sports. "We do often." This doesn't mean they have a relationship, or trust, and that's part of the reason Bryant is a minimalist when it comes to the sharing of the basketball season's page. All along, they were destined to be terrible teammates. They knew it, but could do nothing to stop an inevitable consolidation of their talents. In the end, Kobe Bryant and Dwight Howard need each other, and that's still the best chance for the salvation of these Los Angeles Lakers. Someday soon, they'll need to go far deeper on that page together. Someday soon, the future of the franchise depends upon it.